Written on October 22, 2005, and categorized as Secret and Invisible. I’ve been awake fifteen minutes, and listening to a song I wrote yesterday, or more accurately, finished yesterday. The chords have been shaping around a D retune for a few weeks, the structure emerged in a writing session with The Caliph of Maidenhead and the lyrics arrived earlier in the week. The surprising thing is, it’s a country song. I didn’t set out to write a country song, it just emerged that way, harmonica, harmonies, narrative. In my dream last night, I was chatting with Johny Cash, playing bass while he played guitar, deciding not to attempt to record it in case the moment was lost to another moment and we lost the vibe. I didn’t want to insult the man. We were back of a house somewhere, in a yard I have never seen before. He was warm and easy to be with, interesting and philosophical. I felt close to him and honoured he was spending time with me. Songs are born like babies, and if you are being true to your muse, which is a luxury many commercial writers cannot afford, then they can be as unexpected in their personalities as people. This new song is about a relationship which creates miracles, and as the relationship fades, so do the miracles, but once it’s over, then the miracles return. Songs and music tie times and places together in deep and unmistakable ways.. across the skein of time, they loop back and forth, bringing memory and meaning. This morning, I am feeling strangely delighted that the Man in Black deigned to visit me in my sleep. We shared the same birthday, me, Johnny and Victor Hugo. I’ve always felt a connection. I’ll accept this as a good omen. 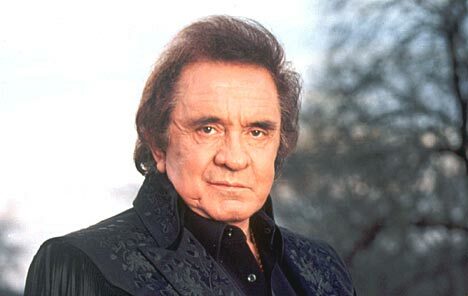 Songs and music do tie things together and I’m delighted that Mr. Cash played bass for you in your sleep. I now have “Daddy Sang Bass” playing in my head at 5:25 a.m. and a nostaligically nebulous delight of my own smiling through me with the melody. “One good thing about music when it hits you, you feel no pain”. Sounds like you are on drugs! You know I’m a bit crazy but I was just reading a newspaper article about June and Johnny Cash yesterday and then you dreamed about him. Hmmmm. I think it was actually a visitation, especially since you share a birthday. I hope he visits you again sometime. I made out with George Clooney in a dream once but I don’t think it’s the same thing. Clooney being alive and everything.